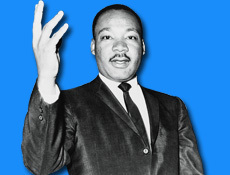 On the 15th January marks another birthday of Dr. Martin Luther King whose legacy to the world is immeasurable. The coward who assassinated him actually gave him immortality. The words of this great man live on and even the assassin and his cohorts must celebrate his birthday. What an irony. On his birthday we remember him and his words which are still relevant today as they were in 1968. We have come a long way to achieving Dr. King's dream but we have to go further. People with the heart and wisdom of Dr. King perhaps are not meant to live for living sake. Perhaps they were sent by the Creator with a message and once the message is delivered they must return from when they came and move on to bigger things. Children who were not even born when Dr. King died have attached themselves to his message. Dr. King's words will remain vital and relevant as long as there is injustice in the world, as long as there is oppression and racial discrimination in the world and as far as I can see, he will be with us for a long, long time. Below is an excerpt from Dr. King's I have a dream speech. "I am not unmindful that some of you have come here out of great trials and tribulations. Some of you have come fresh from narrow jail cells. And some of you have come from areas where your quest -- quest for freedom left you battered by the storms of persecution and staggered by the winds of police brutality. You have been the veterans of creative suffering. Continue to work with the faith that unearned suffering is redemptive. Go back to Mississippi, go back to Alabama, go back to South Carolina, go back to Georgia, go back to Louisiana, go back to the slums and ghettos of our northern cities, knowing that somehow this situation can and will be changed.